Here's the sample panel that we started at Springwatch last year (see below). 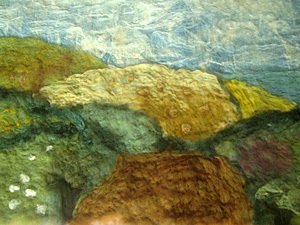 All of the colours were hand-dyed using a variety of natural colours. The dark greens were modified in a copper solution and the sky blue was woad.. 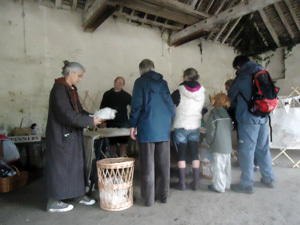 Here we are last June, laying out our soft fleece in the barn at Stanmer, as Bill tied the first of our yurt trellis poles and the Stanmer Handbell Team serenaded us and the members of the Buxted Spinning Group who were sharing the space. 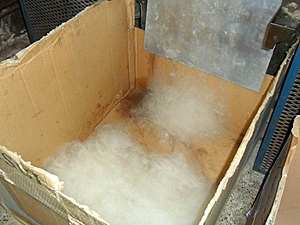 This month we travelled to Diamond Fibres to gather up our washed fleece as it emerged from the carding machine. It was delightful work, like squishing clouds into cardboard boxes. Separating each layer with newsprint paper, we filled up a box and covered it with a piece of wood and a couple of heavy (very) weights. Thank you, Roger. 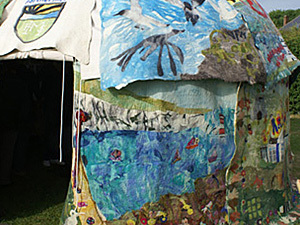 Based on the Medina yurt (above) we want to be able to make up packs for volunteers of a half-felted base layer and a selection of colours for the top decorative layer. Do get in touch if you would like your group to be involved. 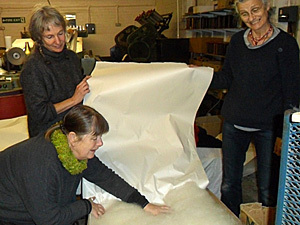 Katy kindly volunteered to felt up a sample using three layers of our carded fleece. Here's the resulting felt on top of the original sample.